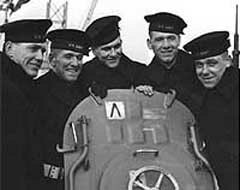 Wreckage of the ship that Waterloo’s five Sullivan brothers were on when they died — the USS Juneau — has been found more than 75 years after it sank during World War Two. A research team funded by billionaire philanthropist Paul Allen discovered the wreckage in the south Pacific on Saturday, St. Patrick’s Day. The Microsoft co-founder announced the discovery Monday in a post on his website. According to the post, wreckage of the Atlanta-class light cruiser was found about three miles below the surface, resting on the ocean floor off the coast of the Solomon Islands. The USS Juneau was hit by a Japanese torpedo during the naval Battle of Guadalcanal on November 13, 1942. The Sullivans — George, Francis, Madison, Joseph and Albert — all of Waterloo, were among the nearly 700 sailors who ultimately died in the attack. The five siblings enlisted in January 1942 with the stipulation that they serve together. Their deaths are believed to be the greatest military loss by a single family in U.S. history. According to several reports, approximately 115 of the USS Juneau’s crew survived the explosion, but only 10 were rescued from the water eight days later. The Navy delayed the search for possible survivors for several days due to the high risk of further Japanese attacks.